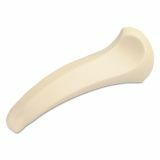 Softalk Standard Telephone Shoulder Rest, 2-5/8W x 7-1/2D x 2-1/4L, Ivory - Comfortable and versatile telephone shoulder rest is soft, fits either shoulder and won't slip. Fits regular or trimline phones and attaches easily. Matching telephone colors.